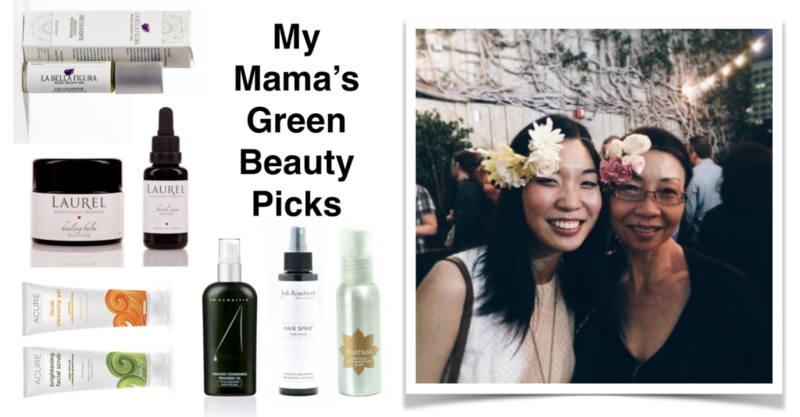 In honor of Mother’s Day, I bring you my mama’s picks from the green beauty world. She was slightly resistant to greening her routine at first since she long developed her own groove, but graciously opened up to my obsession with healthy beauty. What started with me pushing products onto her to try has turned into her purchasing them herself or requesting suggestions from me. I’m a proud mama hen of a mama hen. It makes my eyes look nice. My eyes look less baggy. Also, the smell is really good and even though it is an oil, it doesn’t feel oily because the skin absorbs it in. I think it definitely tightens up the skin around my eye and makes the skin tone better. I really see a difference. Disclaimer: I queried my mom and she graciously provided answers. Only editing was for grammar and editorial notes. All products purchased by her, images screenshotted from each respective brand’s website. Image of the two of us was from A Night From Green Beauty last summer in Los Angeles. Affiliate links are included. I love a whole family green beauty routine! I tried the Pratima sunscreen thanks to you and have loved it. Like your mom, I'm stocking it for the summer. I about did a spit take upon learning how the Dr. Alkaitis Nourishing Oil was used! HAHA! Fancy indeed though I could never bare to only use it as a makeup remover. I must be one of the few who has not had good results with the LBF Eye Oil, I found that it was just so bleh. You guys are so cute! I miss going to events with my mother. 🙂 I love Laurel WPO line as well. It's funny weird that she has allergic reactions on her neck. I get hives on my neck from stress and boy it's ugly. Healing balm works great! Your mom's explanations are precious!! I need to green my momma up a bit. Practical + frugal are in her vocab so she tends to use anything that's on hand. This is too cute! What great taste your mama has 🙂 I like her straightforward, no-nonsense reviews … she gonna start a blog soon or what?! I think the repurchases / stock-ups are a big testimonial! Jade have you used the LBF eye oil? I've had my *eye* on that for a while but can't justify taking the plunge just yet. Everytime I read one of these good reviews, I move to buy it but just keep seeing this listed on places like ebay from people who say it wasn't good for them. Hi Amanda! I used it for a little bit out of curiosity before passing it on. I have heard some negative things about the eye oil as well, such as the oil stinging the eyes, the oil having two many essential oils to be near the eyes, etc. But to each their own–I'm particularly fond of SkinOwl's Eye+, which feels mega refreshing (a joy in the morning for puffy eyes). Also, I think Josh Rosebrook's eye oil, Oculus, has actually lightened up the darkness under my eyes a bit. Thank you Kim!! She's a woman who knows her mind 😉 Haha! That would be fun. Given her pickiness, her repurchases are a great testimonial! I'm so glad you enjoyed it! I wonder if DIY and Whole Foods might be up her alley? Her neck is really sensitive to her hair and materials like wool which make it itchy. Sorry to hear you get stress hives but glad to hear Healing Balm works great for you too! To each their own! I didn't use it long enough to have an opinion, and I passed it along to my mum out of curiosity. I'm glad at least she enjoys it. My mom enjoys sticking to what she knows, but I nudge her with new products every now and then hehe. My mum still uses dirty makeup–that's still a struggle arena. One battle at a time! Thank you Amber!! Haha, my mom still sneakily buys some Olay anti-aging cream from Costco and I'm like, "Mum!!!! All these green beauty products are naturally anti-aging!!!!!! Why???" Thank you Ruhi!!! I'm so glad you enjoyed it!